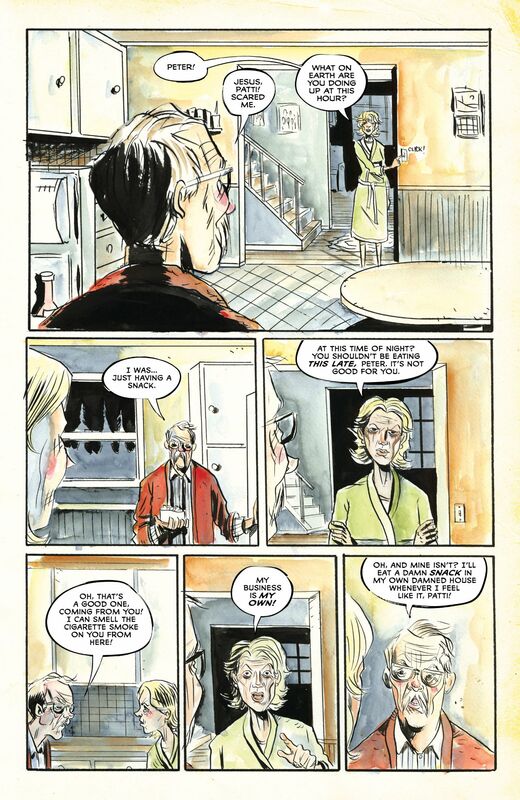 Jeff Lemire is a cartoonist with the unparalleled skill to ground the domestic in the fantastic. In Sweet Tooth, he explored absent fathers and orphaned sons in the fallout of a genetic apocalypse. In Animal Man, he showed how the bonds of family can withstand the most hellish intrusions. Lemire has managed to pull off this difficult feat once again in his new series, Royal City, which he writes and draws for Image Comics. The debut issue, released last week, presents an estranged family living in a changing industrial city, but Lemire also paves plenty of space for weirder potential. The story ignites as an elderly man, Peter, falls into a stroke after confessing, “I swear you can feel it late at night, a weirdness creeping around the edges of things.” His children—ambitious land developer Tara, failing writer Pat and alcoholic Richie—unite around him, exposing the tensions wrapped around the clan’s history. 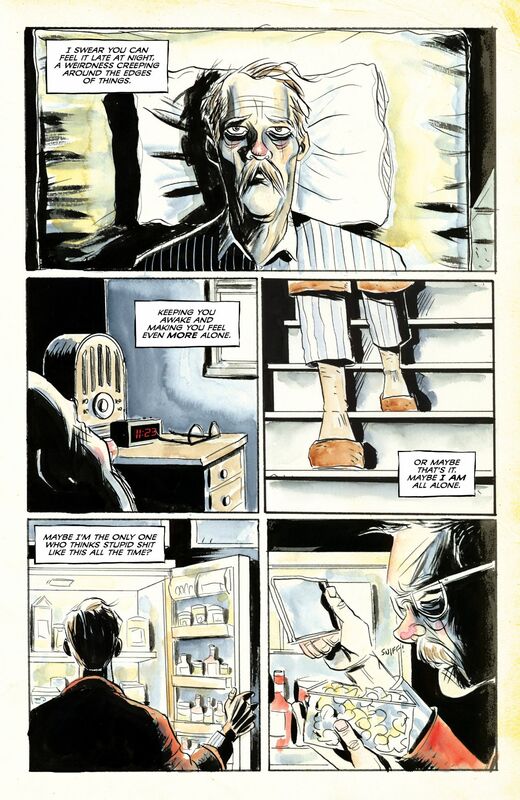 A fourth sibling, Tommy, presents a larger mystery, as Lemire portrays him at multiple ages and states throughout the issue. 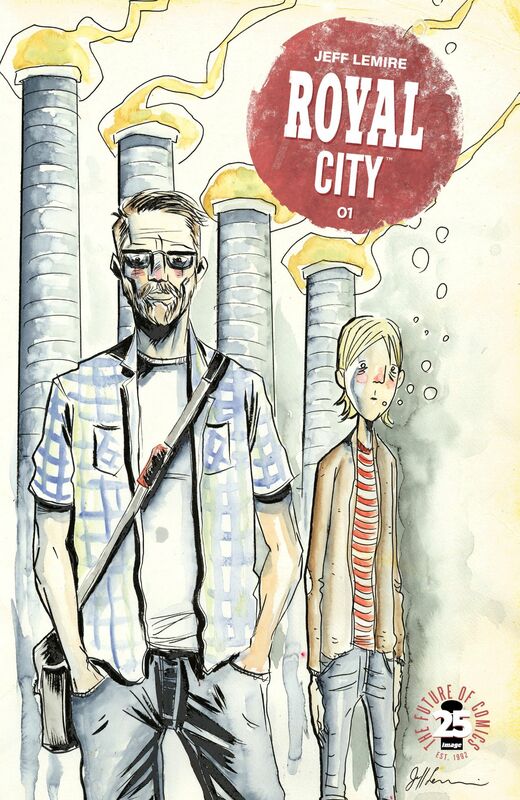 Paste chatted with Lemire about the genesis of Royal City, its relationship to his rural masterpiece Essex County, its connections (or lack thereof) to the Canadian city Guelph (nicknamed “The Royal City”) and the now-defunct indie rock band of the same name. Paste: In an essay in the back of the first issue, you mentioned that you’d been working on this series for about a year and a half before the first issue was released. Does the book differ substantially from what you initially conceived? 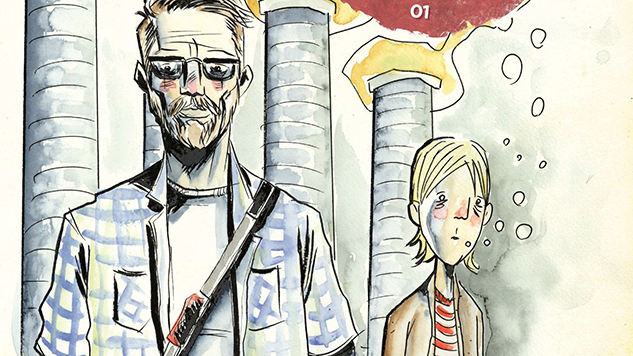 Jeff Lemire: The first issue was actually drawn a while ago, before I started on A.D. with Scott Snyder. Then I had to put it on hold for about a year while I drew A.D. before I came back to issue two. In that time, the story certainly evolved, but I would say that the overall direction, tone, mood and ideas are the same. I was just able to layer a few more elements into it and get a firmer grasp on the characters in that time. So to answer the question, I would say it evolved and grew more than changed, if that makes sense. Paste: To what extent is the Royal City featured in this comic based on the actual city of Guelph, and to what extent is it entirely your creation? Lemire: It’s not really based on Guelph at all. It’s an imaginary town somewhere in North America. Guelph isn’t really a factory town, it’s more of a university town. Where I grew up, in Windsor, Canada, is a lot closer to Royal City. I worked in an auto factory in Windsor from when I was 14 to 21, every summer, 12-hour days, six days a week. I hated it. But it certainly informed this book. And I do have an affection for Guelph. I went to university there for a year when I first left home, and the place holds a special spot in my life and memories. And a Guelph band named Royal City was partially the inspiration for the book’s title. Paste: Over the course of the first issue, there are multiple versions of the character Tommy with radically different appearances. Was there one version of him in particular that was the hardest for you to get right? Lemire: Priest Tommy is the hardest to get a hold of because he has the least amount of personality, at least so far. He is very guarded and reserved. So he took some time. The teenaged version was the easiest. He is just a kid from 1993 who loved Kurt Cobain. So that was my starting point with him. Paste: Structurally, you’re doing some very interesting things with narration—especially the text that accompanies Peter’s tinkering with his radio. How did you weave that into the story? 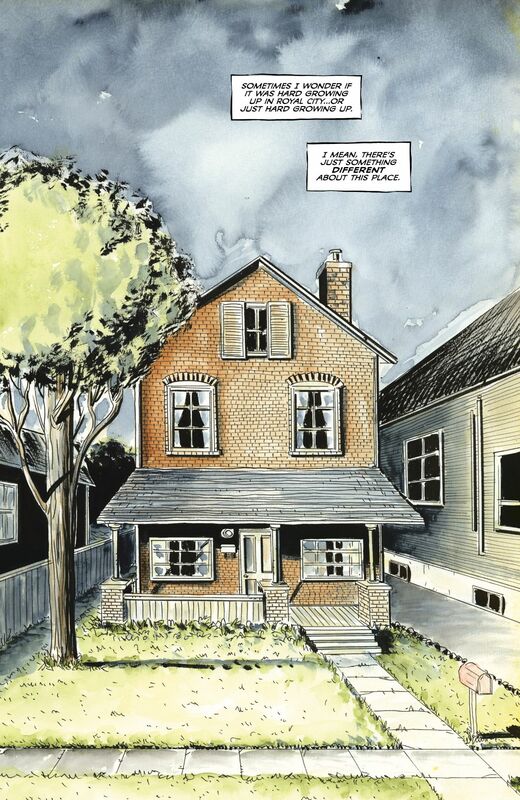 Lemire: That’s sort of the joy of writing and drawing your own stuff. Normally you have your ideas, you write the script and you then send it off to the artist and move on to the next thing. But when I draw myself, I write a script, as I do for another artist, then I start thumbnailing and drawing. So you literally have hours and hours, day after day with each page as you draw it, where you’re sitting there thinking about whatever panel or scene you are drawing. All that extra time to think it over as your own artwork adds to whatever your original intent was, it allows you to change and experiment and discover things as you go in ways you never could if you were just writing a script. Paste: In terms of the pacing of the issue, there are two splash pages that stand out: Richie’s vision of drowning, and Peter standing before a giant radio. How do you best balance the surrealism of those moments with the more realistic setting of the book? Lemire: It’s very organic. There is no set rule or plan in terms of how I layer in those moments. It just comes from feel and from instinct at this point. You don’t want to overdo it with that stuff, but you also want a balance, you don’t want too many pages of talking heads. So you let the story and the pace unfold and trust your gut. Again, the joys of writing and drawing it all by yourself, this freedom to experiment and adjust as you go. Paste: There’s plenty of history between all of these characters, some of it going back decades. How do you determine what to state and what to leave implied? A lot of that comes from everything I have planned. I have the lives of all of the family members figured out in great detail, going back to when they were teenagers. So I also know what is coming and what needs to be established and what can wait and be left unsaid for now. The thing to remember is that in real life, people don’t go around recapping their lives and their relationships with other people all the time. People don’t talk like that. You can learn a lot about people and about their relationships with one another just by watching them talk, even if the details are left unsaid. You can fill in the blanks. So the dialogue needs to be more like that, otherwise it feels very much like exposition and like “first-issue set-up”. So you have to find a balance. My rule of thumb with dialogue has always been “less is more.” Only say what you absolutely need to. Let the art do its job, too. Paste: The character of Pat is a writer who’s known for a work about his hometown; in your essay, you allude to Royal City as a return to some of the same terrain as Essex County. Are you playing at all with the idea of him as an authorial surrogate here? Lemire: I just thought it would be fun to base one of the characters on myself, as I’ve never done that before. But instead of him just being me, he is me if I had made all the wrong decision in my life. He is me if I had really screwed up and made bad creative choices, bad life choices, etc. It’s sort of fun to self-destruct on the page so I don’t have to in real life. Paste: When I first heard the name of the series, I found myself thinking of the band of the same name, so I was excited to see them included on the playlist that you made for the first issue. Do you see a connection between the tone of the series and the music that they made—which also explored disquieting and dysfunctional families? Lemire: I was really into the band Royal City back in 2004, 2005. At the time I was working as a cook at a restaurant here in Toronto called La Hacienda on Queen West. The second drummer of Royal City, Lonnie James, worked with me and the band used to come in all the time for food. So I sort of knew them and would go watch them play live a lot. I think my work has been very informed by music. It has been ever since Essex County. The music I like and listen to is very much in line with the kind of comics I like to make. Listening to certain music can really put me in the right mood and set the right tone emotionally for me when I am writing or drawing. That’s why I included the playlist in issue one and will have one in each issue. A nice complement to what I’m doing with the comic. Paste: Their song “My Brother is the Meatman” remains one of the best song titles ever. Lemire: Agreed. My favorite Royal City song was “I am the Vine”.